CARESTREAM DIRECTVIEW Vita XE CR System is designed for small-to-midsize hospitals, clinics and practices that need a compact digital solution at an affordable price. 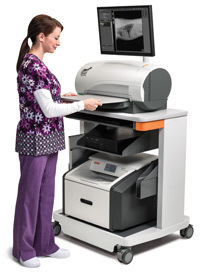 With a throughput speed of 69 plates per hour*, the Vita computed radiography system offers in-house, high-quality digital imaging to fit your workflow. Big performers for small facilities. Say goodbye to purchasing film and chemicals. Customize your Vita XE CR System. Long-Length Imaging - Capture and process digital images of longer anatomical regions. Easily handle spinal exams, even those with images too large for a typical 14 x 17 inch screen. A portable caddy with an embedded grid, and a wallstand with grid and beam-attenuation fi¬lters are also available. Compact Cart - This cart features a compact design and easy mobility. It meets all medical standards and quality requirements, and accommodates any commonly used PC. Options include flexible configurations including additional cassette and PC holders. We offer a full line of CR Cassettes and flexible phosphor screens to meet the needs of your clinical applications. Our Vita Flex CR and Vita cassettes are available in multiple cassette sizes and can handle all major exam types with confidence. Switching from film to digital diagnostic imaging can seem like a big step for a small veterinary practice. Upgrade to digital easily and affordably with CARESTREAM DIRECTVIEW XE Vita CR System and CARESTREAM Image Suite V4 Software that gives you high-quality images in just minutes for faster diagnosis of the animals in your care. Provides sharp, clear images for more accurate diagnosis. Offers image storage on hard drives, CDs or other removable media. Ideal for veterinary practices, the DRYVIEW 5700 Laser Imager offers speed, simplicity and affordability when a hard-copy print is needed. A complete digital image acquisition and management software solution. BCF Technology shares a “bear-side” imaging story and offers advice on how to evaluate technology. Simple and affordable dry laser imaging to improve productivity and patient care.